The dataset is split into N folds. N–1 folds are used for training and one fold is used for model performance estimation. At each iteration, the model is evaluated on all N folds independently. The average score with standard deviation is computed for each iteration. The input dataset to cross-validate. The number of folds to split the dataset into. Train on the test fold and evaluate the model on the training folds. Shuffle the dataset objects before splitting into folds. Sets the type of return value to pandas.DataFrame. The type of return value is dict if this parameter is set to False or the pandas Python package is not installed. Each key (if the output type is dict) or column name (if the output type is pandas.DataFrame) is formed from the evaluation dataset type (train or test), metric name, and computed characteristic (std, mean, etc.). Each value is a list of corresponding computed values. 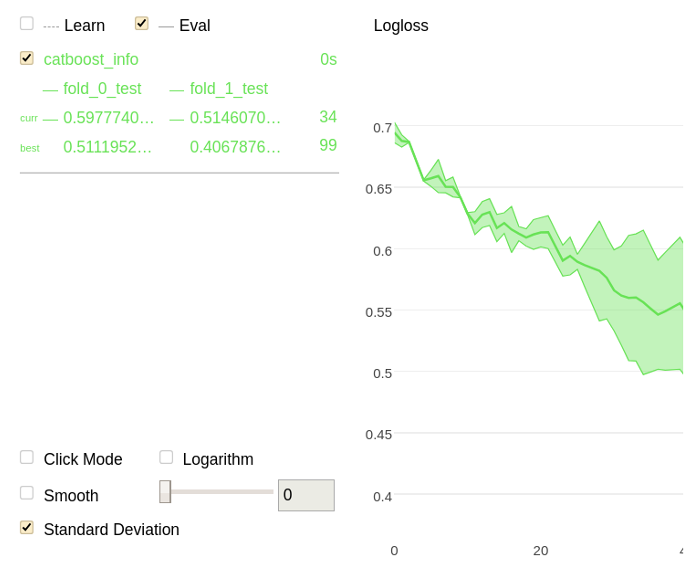 Each key or column value contains the same number of calculated values as the number of training iterations (or less, if the overfitting detection is turned on and the threshold is reached earlier).